Mr know-it-all to the right has carefully planned for us this section dedicated to bringing you the world's hardest math questions. The questions are such that most could understand them, but it would take more than a nuclear scientist to solve them! The idea is not to solve them, but to be confident in the knowledge that no-one else could solve them (unless given masses of time and a super computer - and probably not even then either) - thus being blissfully ignorant that anyone has even bothered to try and work them out at all. Also, this gives Mr Know-it-all a huge ego boost as Mr Know-it-all and only Mr Know-it-all has all the answers. Actually, all this is a lie; the real intention behind this section is to humiliate you, and to humiliate you big-time. Seriously, for the few who do attempt to work them out, I wish you luck, and please, please send in your answers (or comments) to the Skytopia Forum so that I can show Mr Know-it-all and possibly deflate his ego just a little. OK, OK, I'll start with a few 'dead-easy' ones just to 'prepare' you for the killers later. a: exactly one of the throws. b: one or more of the throws. 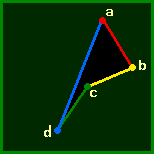 3 points are chosen at random along the square's outline. They then combine to form a triangle. a: What is the probability that the centre of the square will be 'engulfed' by this triangle? (still 3) What is the probability that the centre of the dodecahedron will be engulfed by this tetrahedron? a: You throw a coin multiple times. What's the average amount of throws required to obtain 2 heads in a row? Starting at number zero, you throw a coin. Question is: (b) - how many times on average would 0 have been 'hit' if you threw the coin 100 times? This question is actually possible to answer, but you might need to use a computer ;-) [at which point Mr Know-it-all promptly interrupts] "Notice readers, how he's implying that my calculating ability is equal to or surpassing that of a computer - cheers ;7 ... And no; the reader will most certainly /not/ use a computer to help on this" ........ Ignore him readers. It may be your only chance. The highest possible answer is 50 (0, 1, 0, 1, 0, 1 etc. ), and the lowest answer is 0 (many, many ways of getting this), but I want the /average/. What's the average amount of times you'd have to throw the coin before zero was hit upon again? 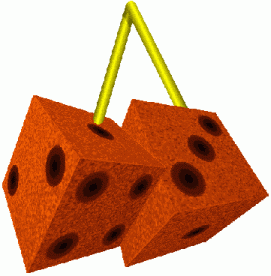 4 random points are chosen in a square. These points are then linked to form a 4 sided polygon. For a demonstration of this, see the blue and green square for possibilities. 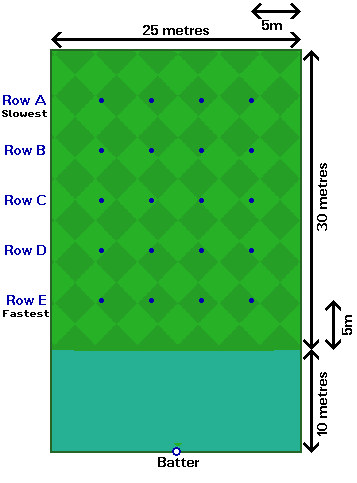 a: ('easy' ^-^ difficulty rating: 2.5) What is the average length of any one of the lines? (1)What is the average size of the resulting polygon area going to be? 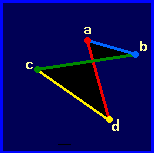 (Bearing in mind that if the lines cross-over (as shown in the blue square), then "polygon" is defined as the sum of the 2 black triangles). (Yes, I know. The lengths I'll go to make a 'problem' for the conditions set in the puzzle =P) To make things even more exasperating, the ant has the memory of a fish and forgets what direction it has just walked in. ( [reader] "You're just making this plot up as you go along to fit in with the problem aren't you?" ). Anyway, after the break, it gets all dizzy and thus chooses another random direction from 0 to 360 in an attempt to escape the circle again). As you can well imagine, it could escape the circle after just 2 walks (just one break needed). Or... it could take 20,000 walks (19,999 breaks needed)!! There might even be the very slim possibility it might take 20,000^20,000 walks. You can probably guess what I'm going to ask. What is the average amount of walks required for the ant to escape the circle? Mr Know-it-all realises there may have been a /chance/ that you got the earlier "Enveloping Lines" question, so here's a trickier version. Good luck. 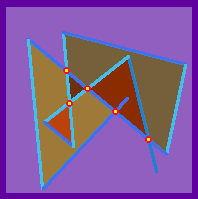 Now take a look at the example purple square below. 10 points are randomly chosen within the square - and are connected to form 9 lines. a: ('fairly hard'* -.- difficulty rating: 4.5) (1) On average, how many junctions (indicated by the small red/yellow circles) will be created? (2) Also, how many junctions will each line produce on average? For example, the line on the far left has no junctions, but the one going through the centre from bottom-right to top-left has 4 (count 'em!) junctions. And (3) What is the probability that no junctions will be made from the 9 lines? b: ('very hard! '* -_~ sub-difficulty rating: 5.5) If the square has a width and height of 10cms, what is the average area of an 'enclosed' part (indicated by the brown areas) ? .....A bit like the earlier coin question, but with the addition of some geometry. 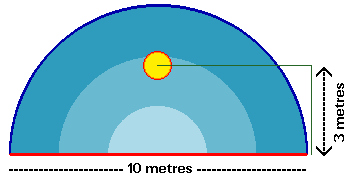 10 metres away from someone is a circle with a diameter of 1 metre. The idea is that he chooses a completely random number from -90 to +90 (relative to the target) and uses this number as his direction in degrees. Each 'occasion', he walks 2 metres, before he has to stop and take a break. Of course, he may easily miss his target (and since there is no going back thanks to only 180 degrees of movement), what's the chance he will hit it? See left for a brown diagram showing the various lucky possibilities that hit the target. The random direction now extends to 360 degrees. Thus he could theoretically take 1000 years (or 1,000,000 'occasions') to hit it, but it is possible. What's the chance of hitting the green target directly on (not before or after) the thousandth attempt? See right for a purple diagram showing one of the various lucky possibilites that hit the target (except this doesn't count - as it only took 17 attempts). a: the moment the ball has been hit, the catchers 'magically' know where the ball will end up, and start moving to that position at a constant speed. b: the catchers always catch the ball if they can reach it. 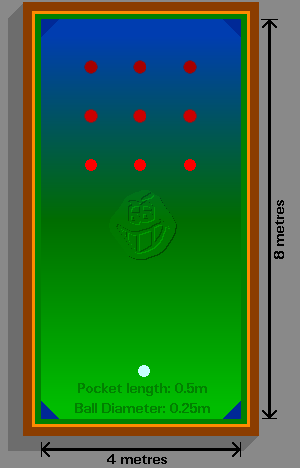 c: the batter hits the ball such so that it only lands on the patterned green area, and that each 'spot' of this pitch is just as likely to be reached as any other 'spot'. d: The ball travels at a speed of 10 metres per second. 50, 86.6025, 0 (the number 86.6025 is calculated thus: (3^0.5)*50). 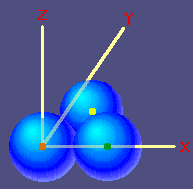 The question though is; if a fourth marble were to rest on top (z axis) of these 3, what would those exact coords be? 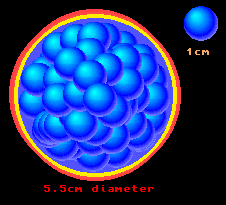 b: A sphere 5.5 centimetres in diameter is filled with 1cm diameter hemi-spheres. What is the theoretical maximum amount of spheres that can be crammed into the mega-sphere? Same as above, except that the spheres are stretched in width by double - to produce an elongated sphere or 'ellipsoid'. What is the theoretical maximum amount of ellipsoids that can be crammed into the mega-sphere? Mr Know it all has something to say... "You've got this far have you? I'm surprised you haven't already given up. Maybe you're just curious to see how intelligent I am, or perhaps you're just hoping you might be able to answer one of the questions beyond this point. [at which point Mr Know-it-all bursts out laughing]"
An easier version of an angle prob to prepare you for what's to come. 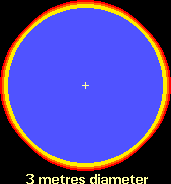 An infinitely small ball is placed at a random point on the red line shown on the right. The line is 10 metres long. The semi-circle that stems from this line is its resulting size too. 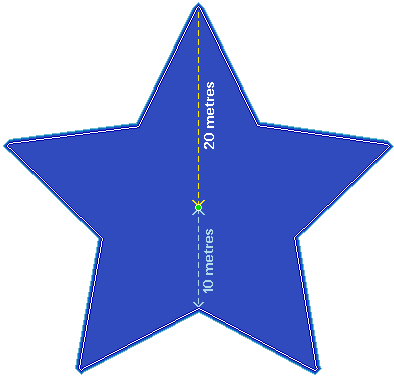 Also positioned 3 metres above the centre of the line is a small circle with a diameter of 1 metre. There is no gravity of any sort by the way. The ball is shot up into the semi-circle at a random angle from -90 degrees to +90 degrees. After it comes back past the red line, it is all over. (difficulty sub-rating: 5/10) What's the chance the 'ball' will contact the yellow circle? The real question (difficulty sub-rating: 7/10) Same question as above, except that the curve (which has now extended to become a full circle) rotates (pivot = point at centre of yellow circle) 45 degrees for every 5 metres the ball has travelled. An (infinitely small) ball starting out in the middle of a 5 pointed star table (outer 5 points - 10m radius..... inner 5 points - 5m radius) has a starting angle of a random value from 0 to 360 degrees. The ball is now set loose and travels around the table. On average, how many sides will have been hit once the ball has travelled 1000m ? 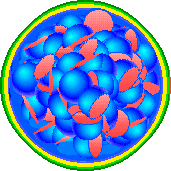 The ball has now got a 'real' size of 1m diameter and thus is affected in weird ways by colliding and bouncing off at tangents with the 'inner' 5 points etc. Now how many sides on average will have been hit once the ball has travelled 1000m ? Also, where are the most likely points that the ball will end up? Mr know-it-all loves this one. Apparently, it's one of his favourites; not because it's challenging for him (which it isn't by the way), but because he knows you won't even know where to begin searching for a solution. The white ball is then shot at a particular angle from 0 to 360 degrees (0 being north, and going clockwise). 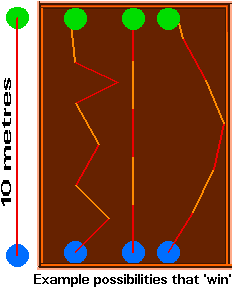 a: What exact angle/s should you choose to ensure that all the balls are potted the quickest? b: What is the minimum amount of contacts the balls can make with each other before they are all knocked in? c: Same as b, except that each ball - just before it is knocked in - must not have hit the white ball on its previous contact (must be a red instead of course). d: What proportion of angles will leave the white ball the last on the table to be potted? And no - Mr know-it-all's imprint on the snooker table is not actually anything to do with the puzzle. offer some information leading to the possible answer of the questions, visit Skytopia's Whirlpool of Knowledge Forum. All feedback appreciated! Nick's Mathematical Puzzles - Presents over 50 math puzzles - selected for the deceptive simplicity of their statement and the elegance of their solution. Grey Labyrinth - More puzzles and conundrums at this interesting site. IQ test - If you think you're good enough, then test your IQ at the world's hardest IQ test. Maths and the Simpsons - Guide to Mathematics and Mathematicians on The Simpsons.